Valedictorian Abby Woodard speaks during the Preble Shawnee High School 2015 commencement exercises held Friday, June 5. Preble Shawnee grads cross the stage to receive their diplomas during the ceremony held Friday, June 5. Ninety-seven students graduated as part of the Arrow Class of 2015. 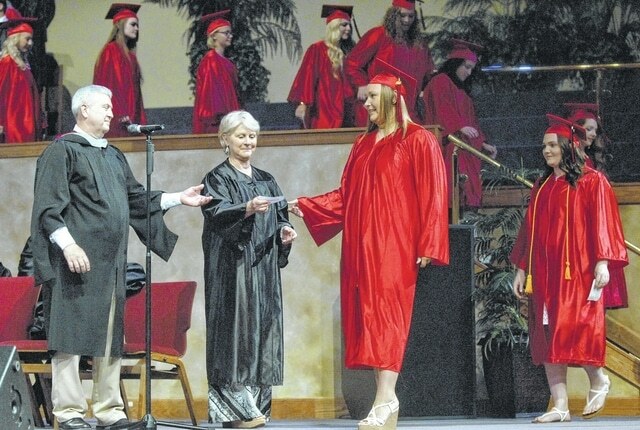 HAMILTON — Preble Shawnee’s Class of 2015 was the final group to say goodbye to their high school years, during commencement ceremonies held Friday, June 5, at Princeton Pike Church of God. Some 97 graduates crossed the stage, received their diplomas, and took the first steps into the next phase of their lives. This year’s graduates received more than than $500,000 in scholarships, according to school officials. “The time has come. A time that many of us were ready to a happen, and a time that many of us will dread; a time to share memories with other, but also a time that we say goodbye,” Sterling Leach, Senior Class elected speaker told those in attendance. “We say our goodbyes not only to a school that has shaped us into respectable men and women, but we also say goodbye to each other. “We’ve been with each other almost every single day between August and June for thirteen years, and now that will be coming to an end. Don’t look at this as a sad time though, we’ve learned so much from each other and about each other. We’ve created a bond with each other that is inseparable. “I know that I haven’t personally connected with everyone, but that doesn’t mean I don’t know you. I wouldn’t want to graduate high school with anyone else,” Leach added. Salutatorian Shelby Thompson spoke on success. Thompson continued: “You can work and give it you all. You can try your best to always pay attention in class, even if it isn’t your favorite subject. Turn in your favorite assignment, even it means staying up most of the night. Study hard and ace every test. Do everything you can. But what, exactly, is the point? To get into a good school and further your education, get a great job and become a millionaire? Maybe. But let’s look into it a little deeper. What is the motive for all our efforts? What will all of things we have striven for, all that we have accomplished, bring us in life? I sincerely hope the answer is happiness; whatever that means to you. “I was fortunate enough to have a father who could instill in me a strong ambition. He pushed me to meet my potential, and believed in me even when I did not always believe in myself. I am also exceptionally fortunate to have a mother teach me that there are times to just slow down and take it all in. That there is a time for work, however there is a time for play. They have both shaped me, helped me grow, and find my own balance in life,” Thompson said. “Okay, so I’m super nervous. It’s funny to me that the reward for being valedictorian is public speaking which is also the number fear among Americans; more than death, spiders, bugs, snakes, drowning, strangers, ghosts and disease. So thank you for at least giving me a podium to hide behind,” Valedictorian Abby Woodard said. “I would like to thank my parents and other family members who whipped me as a child because it looks like I just might turn out okay. But really, on behalf of the Class of 2015, we would like to thank our families, supporting us in our times of success and being there to catch us when we fall is something we will never be able to repay you for. If it wasn’t for you constant nagging, I mean your encouragement, we wouldn’t be the successful men and women that we are today. I could stand up here all night and thank you for the awesome things they have done for us and tell you how much your love and support truly means to us, but I know that some of you have probably ordered pizza for after this and I don’t want to screw up the time tables,” Woodard joked. “I would personally like to thank the entire student body of Preble Shawnee. What would your crazy high school memories be if you had no one to share them with? These people went through our awkward pre-teen haircuts and know at least 85 percent of our secrets, so it’s too late for them to back out now. So thank you guys for being awesome. There’s no one else I could imagine going on this unforgettable journey with,” Woodard said.